DENVER – On a night like many others, everything changed. Stephen Curry had these thunderclap games before, but never in the playoffs, and that moved him to a new level. Warriors owner Joe Lacob had felt vindicated by his gamble before, but never like this as he searched for the explanation of what a performance in late April means years from now. That’s the key description: late April. May or June work, too. Curry cut up the Nuggets in the playoffs is the thing. The time when reputations are really earned by anyone hoping to gain entrance into the world of NBA stars. Curry has definitely built the resume, even while being passed over for the All-Star Game in what had to have been a near miss. He is arguably the best shooter in the game. He finished seventh in the league in scoring. He set a single-season league record for 3-pointers. He is back in the Team USA mix. But for true credibility, for generating buzz unlike anything that could happen in a dozen of these Tuesday nights during the regular season, there was Game 2 of the first-round series and Curry going for 30 points, 13 assists against one turnover, and three steals to lead Golden State to a 131-117 fireworks show of a victory at the Pepsi Center and a 1-1 tie in the best-of-seven matchup that moves to Oakland. And there was also teammate Richard Jefferson in front of his locker after the game. Jefferson has played 12 seasons and is in the playoffs for the ninth time, some with long runs, so he knows this is different. And there was Lacob, the beaming owner, outside the locker room. Lacob had invested $44 million over four years in October to sign Curry — with a concerning history of ankle problems that remained a pressing issue last season — to a contract extension. It had been obvious since early in 2012-13 and now it had become official the once-risky move was now a brilliant one. Had the Warriors waited until July to re-sign Curry as a restricted free agent, wanting proof that he could hold up, it would have cost the franchise millions more. At the very least, Curry would have upped his asking price. At worst, another team would have gone completely over the top with an offer sheet. Golden State would have needed a millisecond to match, but at a much greater cost than an average of $11 million annually. “Besides the fact that I’m getting an ulcer and my neck is killing me I’m so nervous?” Lacob said, smiling. Yes, exactly. Besides that and all the way to an extra feeling of vindication. Lacob paused and broke out in laughter. One night was that big of a deal, to the team and the player and the entire franchise moving forward. One night was Curry taking the next step. Things had become different even if they were the same. HANG TIME WEST – The next step is to prove they can handle the playoff intensity, and there is reason to wonder. The Warriors did not handle the raised expectations of the second half of 2012-13 well, their playoff opponent beginning Saturday afternoon is postseason tested, and Golden State must prove it can stand up to the moment while playing at altitude in a building where the Nuggets lost all of three times in 41 games. But what a time to face the doubt. The perfect time, actually. The Warriors having something to prove in the first round that opens at inhospitable Pepsi Center will come as merely the latest installment of a season of responding to skepticism. Well, some of the ankles. The Andrew Bogut issue remains after he missed 2 ½ games late with a sprain, the same left ankle he fractured last season and eventually required the dreaded microfracture surgery. Although the starting center returned Wednesday at Portland, the condition of the ankle will be a storyline at least early in the series. Stephen Curry, on the other hand: proven. A history of ankle troubles, all of 26 games last season amid serious doubts about his dependability, and now 78 games, on the verge of becoming an All-Star, arguably the best shooter in the league. Coach Mark Jackson: proven. It was well-deserved skepticism because Jackson had never been an assistant or head coach. His rookie season, 2011-12, was an unfair read, coming in a lockout campaign with an abbreviated camp and a truncated 66-game schedule that allowed little practice time and a major trade in the middle. But one year later, a roster relying heavily on rookies and hit by injury has a much-improved defense and a much-improved outlook. General manager Bob Myers: proven. His lack of experience in the front office, after a career as a successful agent, made the quick promotion by owner Joe Lacob a risky move. But last summer, in his first offseason running basketball ops, Myers delivered with a veteran’s consistency. Draft Harrison Barnes, Festus Ezeli and Draymond Green. Trade for Jarrett Jack. Sign Carl Landry. Nonstop direct hits. Lacob: proven. Getting booed at home last season the night the Warriors retired the jersey of Chris Mullin was always an undeserved low blow. But Lacob has now earned a special level of credibility by delivering on the initial promise to inject a new atmosphere around the organization and, most importantly, a return to the postseason after years of letdown. He picked Jackson. He picked Myers. He spent big. Get that man to Mullin jersey ceremony now. The season has answered so many Golden State questions. Bogut’s health is the lingering to-be-announced outcome, and the playoffs will go a long way toward the read. Productive weeks now can overshadow absent months before. This is his chance, just as all the Warriors have the opportunity to prove something beginning Saturday. HANG TIME HEADQUARTERS — The sellout crowd, the standing ovation at the end and the playoff chants were all fitting for a team and franchise that achieved against all odds this season. Late Tuesday night in Oakland, one of the NBA’s most rabid fan bases was rewarded when the Golden State Warriors clinched the franchise’s second playoff berth in the past 19 years. Nobody celebrates these things better than the Warriors, who cashed in on their last playoff appearance in 2007 by shocking the Dallas Mavericks in the first round. Warriors coach Mark Jackson has been a believer in his team all season and that faith has been realized now in the form of a team that won six of its past eight games to strut into the playoffs, as opposed to slipping through the back door. Much like fellow Tuesday night playoff clincher Houston, the Warriors have arrived to the surprise of many. They’ve done it without the hype-train that has accompanied the Rockets’ rise. There’s no James Harden or Jeremy Lin headliner on this Warriors team (although an All-Star like David Lee and shooting star like Stephen Curry certainly deserve whatever plaudits come their way). The Warriors’ front office doesn’t have a figure like Rockets general manager Daryl Morey, the Wizard of Advanced Metrics Oz, to point to. Warriors general manager Bob Myers has gone about his business without a ton of fanfare. He’s plotting the course properly. The Warriors roster is sound. And they are built not just for a momentary playoff flash this time, but for a sustained period of playoff contention that Warriors fans have not experienced before. It’s the vision that Warriors owners Joe Lacob and Peter Guber have talked about non-stop since taking over the franchise. They have a long-range plan, one that includes being a playoff regular and eventually a contender. When you’re a lottery tea, it’s just fantasy basketball … pipe dreaming, if you will. But when you are a playoff team, the vision is tangible. One thing seems certain, though, and that is the Warriors shouldn’t have to endure another six-year wait between playoff trips. OAKLAND – The Warriors, willing to take the risk of trading for Dwight Howard for 2011-12 even without an assurance of having him for more than one season, are not expected to resume pursuit after the superstar center told the Magic he wants to be dealt, Golden State owner Joe Lacob said Monday. That somebody is the obvious difference. A year ago, they were looking at Andris Biedrins as the possible starter, even by attrition after new coach Mark Jackson said at the time, “The bottom line is, he’s our only legit center on this basketball team.” Bogut was acquired from the Bucks in March, and though he is recovering from a broken left ankle he is expected to be ready for the start of training camp, the Warriors report. Wait, remind me again: Was this Chris Mullin Night, or Chris Cohan Night? A packed house picked the wrong time to be unruly when a ceremony designed to honor one of the all-time Warriors greats turned into an Oakland Raiders game. The way the Warriors fans ruined it for Mullin was shameful and disrespectful. The way they booed the wrong owner, someone who’s willing to move the franchise beyond the decade-long debacle overseen by the old owner, Cohan, was misguided. Here’s what happened: Mullin’s jersey was retired Monday night in a long-anticipated ceremony. Mullin was and is one of the great inspirations in the game, someone who overcame alcoholism early in his career to become a truly great shooter, the face of the Warriors and eventually, a Hall of Famer. He had his family, and his brother’s family, along with a number of former teammates and coaches along for the moment. And quite understandably, the applause for Mullin was thick and warm. And then, Joe Lacob, the new owner of the Warriors, decided to take the mic and speak. For this, he was booed. Heavily. Loudly. And constantly. It was tough to watch, but even more, it left you wondering: Why? OAKLAND – Making official what had seemed inevitable from the time Joe Lacob and Peter Guber bought the team in the summer of 2010, Warriors executives are in discussions to move the team to San Francisco in an effort to get a new arena that would open before the 2017-18 season. Conversations with San Francisco leaders and the top brass of the baseball Giants to build a facility adjacent to AT&T Park are in the early stages, and, it should be noted, the Warriors have also met with Oakland officials eager to keep the team with a new arena. But the chance to across the Bay Bridge and back into San Francisco, the original franchise home after relocating from Philadelphia in 1962, has long been viewed around the league as a potential money maker and one of the reasons so many groups bid for an organization with years of losing. 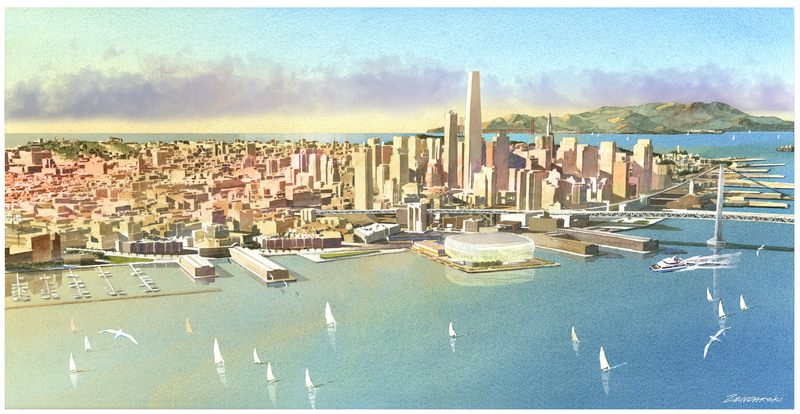 “The potential for building an arena near AT&T Park is very exciting,” Lacob told the San Francisco Chronicle. “The Giants have done some remarkable things over there. It’s a great ballpark that revitalized an entire part of the city. The difference is only about 15 miles between the potential site alongside AT&T Park and the current Oracle Arena home on the same grounds as the stadium that houses the Raiders and A’s. But it could become a leap with financial implications for the entire league. OAKLAND – Rick Welts was never going to be just another basketball executive again, not after announcing his homosexuality in May in a lengthy New York Times article. But then came Tuesday and the press conference to introduce him as new Warriors president and chief operating officer and the realization that things are going to be different on a lot of fronts. Welts did not flinch. He handled that question – The front page of the New York Times is a pretty good way to explain it, etc. – and every other that came his way in the transition from nine years as Suns president to the first official day on the job with the Warriors. Shy away from the possibility of indelicate questions about his personal life, including how he left Phoenix before the end of his contract to be closer to his partner in Northern California? No. Welts embraced his new, very public podium with no plans to withdraw into the relatively quiet life of an executive with no impact on the product on the floor. The Warriors didn’t just fill a vacancy at the top of business operations. They added a willing participant in a conversation of sports and society, and they did it in a market with a large homosexual population. Owner Joe Lacob said the May revelation of a high-ranking executive coming out was discussed, but served no motivation for the hire. Welts said coming to the Bay Area is an especially unique situation, but that it was not a part in taking the job. It’s just how things worked out. The interest is understandable with the rare disclosure in the sports world. Plus he is now in the Bay Area, the story is still fresh, and he’s now a business executive and therefore not in a role to discuss the direction of the roster. What should not be lost is that Welts is a great hire and very well respected after prominent positions at the league office and individual teams. OAKLAND – The latest was announcing Tuesday they had purchased control of basketball operations of the NBA Development League team in Bismarck, N.D., which came after they spent $2 million during the draft to acquire the second-round pick that became Jeremy Tyler, which came after foiled attempts to spend $3 million to get an additional first-rounder, which came after all the spending of the previous months. Paying David Lee some $80 million to come, paying Don Nelson another $6 million to stay away, giving up an unknown ownership share to get Jerry West to join the front office, and – oh, yeah – heading the group that paid a league-record $450 million to get the Warriors in the first place. Joe Lacob and Peter Guber promised a serious financial commitment upon taking control last November, and they have delivered. In a time of economic hardship for many around them, the Warriors have signed huge contracts, fired a high-paid coach with a year left on his contract, handed over a portion of the team to land West, and made a bold strike in the draft. All in less than a year, with the understanding that Lacob and Guber were far enough along in buying the franchise last summer that they probably could have scuttled the Lee sign-and-trade that officially went down on the watch of predecessor Chris Cohan. Golden State was in such buyer’s mode Thursday that the $2 million sent to the Bobcats for Tyler as the No. 39 pick was actually the fallback. The Warriors, Lacob said, had tried to get another pick in the second half of the first round, likely at the going-rate cost of $3 million, which would have meant a second guaranteed contract after drafting Klay Thompson at 11. Nothing materialized, Lacob told NBA.com, because potential trade partners wanted players in return, not money. SAN FRANCISCO – A few days after the transaction had been finalized with the expected approval from the NBA’s Board of Governors, Joe Lacob and Peter Guber were in a hotel suite downtown, discussing what will always be one of their most stunning victories, even if wins start coming in June. They didn’t just buy the Warriors. They beat Larry Ellison to buy the Warriors. It is nothing less than one of the great upsets of this or any other season. No exaggeration. Lacob and Guber had deep roots in sports ownership, and Lacob had an NBA tie with a minority stake in the Celtics, and both obviously have major spending power. But Larry Ellison is Larry Ellison. The software tycoon, a Bay Area resident, reportedly spent an estimated $100 million on his America’s Cup victory in February. A month later, Forbes listed him as the sixth-richest person in the world, with a net worth of $28 billion. Paul Allen in Portland and Mikhail Prokhorov in New Jersey are the ridiculously wealthy among NBA owners. Ellison is worth more than both combined. In the end, Lacob and Guber headed the group that delivered the winning bid of $450 million, a record for an NBA franchise, while Ellison put out a statement claiming that he, in fact, made a higher offer. The company that handled the sale for Chris Cohan indicated the Ellison offer came late. Lacob, the managing partner with a venture-capital firm, and Guber, the chairman of Mandalay Entertainment Group, claimed the long-shot victory that became official last week and led them to a round of interviews in the hotel suite with sweeping views.